This is the week I buy my ticket for the trip to Africa in July! It's also the week I get my shots and apply for my visa. I am really getting excited about being a part of the team that is going to Burundi to participate in the Sister Connection Widow's Retreat! One of the concerns for a trip like this is, of course, finances. The Lord is using the kindness of friends and church family to make this trip possible. But that's not all He is using. We've had a few other sources of income, including a $100 cash prize we won by playing Haggen Monopoly! (Remember last year, when my big prize was a can or corn?!) When I told Abby Nelson from Sister Connection about this she said, "God is even sovereign over Haggen Monopoly!" It is wonderful to see the creative ways God is using to make it possible for me to go on this trip. Now I want to give you an opportunity to make it possible for a widow to attend the retreat, or a child to go to camp. The recent Sister Connection Newsletter talks about the amount needed to make each event a reality. It costs just $30 for one person to attend one of these three-day getaways that are being held in July. Maybe the Lord wants to use you to make it possible for one or more people to attend. This is not, as we know, just about money. Of course money is necessary for the ministry of Sister Connection to operate. But this is really about God working in the lives of people to bring them healing, dignity and hope. It is about the body of Christ loving and praying for one another. It is about the joy of seeing Him work in people, transforming individuals, families and the nation of Burundi through Sister Connection. I invite you to bring this wonderful ministry to the Lord in prayer. 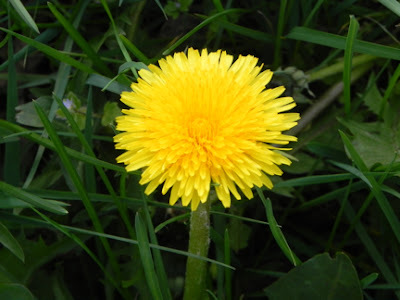 Ask Him to meet all the needs for the summer -- financial needs, travel safety (people come to these events from all over the country), and spiritual concerns. Pray that the Lord would heal and encourage hearts and would draw people to Himself. And while you are praying, He just might show you some way that YOU can get involved too! I have this image in my mind of a beautiful recipe collection, a full-page professional looking illustrated recipe on each page, categorized and neatly filling a three-ring binder. Each of my collected recipes, torn from a magazine, scribbled on a restaurant coaster or printed from the internet, would be perfected to our own liking before it is included in this compelling volume. 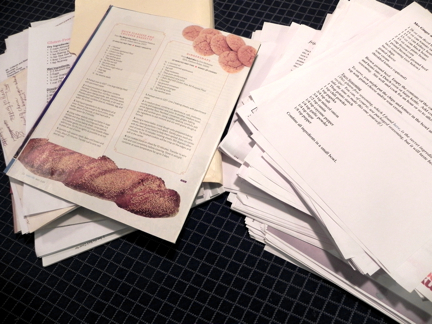 What I have in reality is a massive accumulation of recipes in various sizes and styles, jammed into a couple of overflowing file folders, a recipe box, and one fat binder. They are not "arranged" in any order and I end up finding new ones online instead of digging through all my untamed receptacles for that particular recipe I was thinking about. So I am consolidating my recipes. 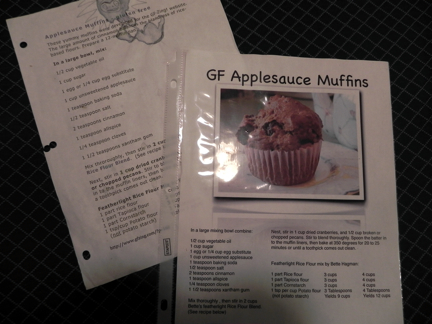 I've gone through the recipes and taped each of the odd-sized ones onto a piece of printer paper. That way all the pages are the same size, and I can make notes on them as I experiment with them. (When you are a gluten- and dairy-free cook, you do a lot of tweaking.) My goal is to get them all sorted by type and put them into a big fat three-ring binder. This process has several advantages. For one thing, it helps me cull duplicates. 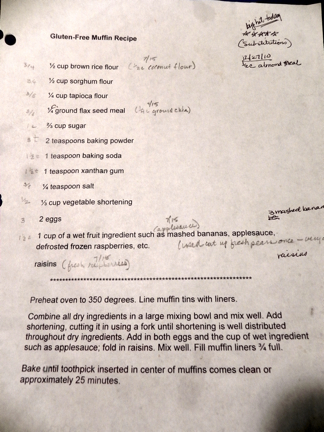 (I had no idea I had a dozen blueberry muffin recipes!) It also makes it much easier to find a specific recipe, but I guess you knew that without my mentioning it. And as I make the notes on the recipes I tweak I can get them just how I like them. This process is also long. 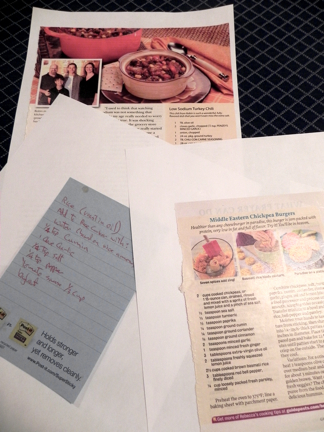 My recipes may never make it into that three-ring binder with a photo of each one. But if they do, I'll get to use my all-time favorite office supply: page protectors! I love those things! I'll slip two recipes, back to back, into a page protector and smile at how well the page protectors keep those recipes from getting messy. What have you done to tame your recipe collection? What tips would you like to share? We'd love to hear them! That's what I've been doing the past couple of weeks, pondering motherhood. 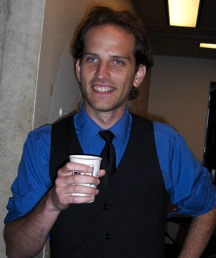 I was preparing for a panel discussion at MOPS. The mentor moms of our group -- women who have raised our kids and are now walking alongside younger women, to give support and encouragement -- would be sharing our collective wisdom at our MOPS meeting, and I wanted to be ready. Well, that panel discussion was yesterday. I loved being a part of it. I loved how preparing brought so much to my heart and mind. I loved the things the other women shared. I loved that it spoke to the MOPS moms. I loved the tears and the shrieks of laughter that intermingled, not unlike the daily life of a mom. I've been thinking about Jesus' mother, Mary. We know the Christmas story, how when Jesus was born the angels and shepherd and wise men and even King Herod were talking about the event. Not Mary, though. Luke tells us that Mary treasured up all these things and pondered them in her heart (Luke 2:19). 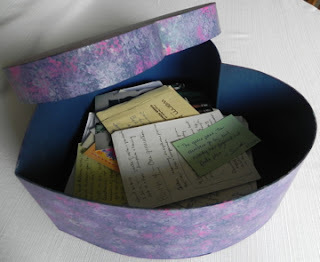 Years ago Mom bought a large paper heart-shaped box and decorated it for me. I called it my Ponder Box. 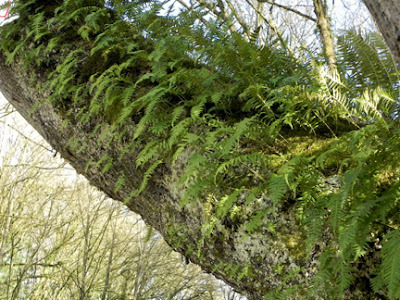 It was a place for me to treasure up the things that needed pondering. The box, the notebooks and the scribbled slips of paper that are stuffed in drawers and file folders around my house all contain things that I am still pondering. 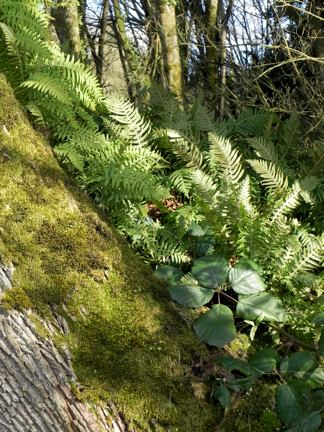 So, starting today, I will do an occasional post about mothering. From time to time you'll see a post with the title "Pondering Motherhood" and then a topic following. It may be my own thoughts or the thoughts of another mom. But it will be from the heart. You may not learn much about potty training on these posts, or when to start giving an allowance. I never did figure those things out! But you will be drawn to the place where mothering begins and ends, the heart. I'm looking forward to pondering motherhood with you. And held it in the morning. On the green slopes paraded. A crowd of veterans talking. And ne'er were heard of after! Ricky Johnston is always thinking. While he was a student (he has a masters and a PhD in economics) he made time to read material unrelated to his studies, things like theology, philosophy, sociology, classic literature, and fairy tales. "Things that make me better understand people, make me question the meaning of life and what I do, and things that make me dream. Training and education go beyond schooling; the real learning occurs when we teach ourselves." Then he adds, "Learn everything you can from everyone you can." It was great and imaginative writers like C.S. Lewis, Dorothy Sayers, Tolkien, G.K. Chesterton, and George MacDonald who influenced him. It's people he has known, like Earl Palmer (former pastor of Seattle's University Presbyterian Church) and Skip Li, a prominent Seattle attorney, and his wife Cyd, and everyday folks in Ricky's life who have left their mark on him. That includes his parents, Don and Denise Johnston. They began to pass on stories about Sister Connection that they had heard from Randy and Alice Matthewson, friends from church. 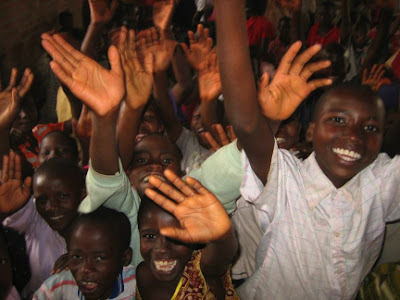 As missionaries in Central Africa, they have spent a lot of time in Burundi, and would talk about the widows there whose lives were being blessed by the support of Sister Connection. The opportunity to build a house for a widow really struck a chord with Ricky. It got him thinking. His employer, Microsoft, matches the charitable donations its employees make to a number of non-profits. He wondered if Sister Connection was on Microsoft's approved list. Indeed, it was! Any gift he would make to Sister Connection would be matched by Microsoft! So Ricky started channeling funds through Microsoft for the purchase of homes for widows in Burundi through Sister Connection. And Microsoft has matched each dollar. 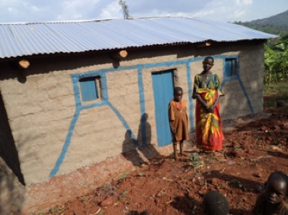 In the past year-and-a-half, Ricky and Microsoft have provided houses for 28 widows in Burundi! Ricky calls it "a buy one, get one free arrangement!" I asked Ricky if he's always been interested in missions and development work. He told me he used to be interested in money and himself, but now he's primarily interested in helping people live better lives. "Sometimes it's helping people with material needs. Sometimes it's encouraging people to give up the material 'needs' they think they have." Ricky loves the outdoors, both the mountains and the water. He hikes in the Cascades every other weekend and loves to hang out with his parents when he can, enjoying the natural beauty of the Northwest. But what he really loves is surfing. 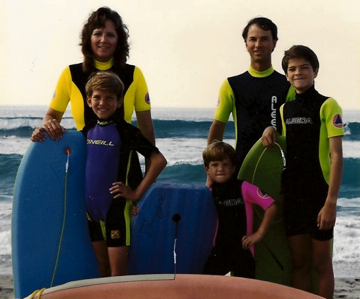 Having grown up in southern California, he could hit the waves early in the morning, surf all day, and stay in the water till his parents dragged him home. 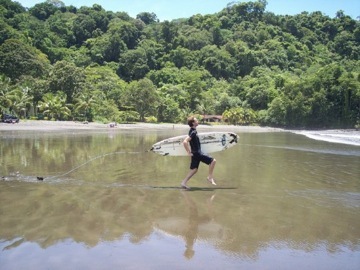 And he still surfs every chance he gets. That's not so often now as he works long hours at Microsoft. One of these days, when he has some time, he'd like to go to Burundi to meet some of the widows he's been able to provide a home for. Actually his long-term interest is to do economic development somewhere in the world, to use his background in economics to make life better for people. He's not sure when or where that might be. "But I hope the place I end up has waves." The widows' homes built by Sister Connection are scattered across the nation of Burundi, where thousands of women were widowed during the ethnic wars that took a million lives. One home costs $600 to build, and SC hires local builders, who use local building materials, providing not only security and status for the widow and her children but stimulus to the local economy as well. Sister Connection provides further support for the women through monthly sponsorship (US $30) to cover basic needs. Job training, an annual retreat for spiritual enrichment and fellowship, and other provisions for these widowed sisters of Burundi are all designed to lead to their self-sufficiency. You can be a part of this remarkable ministry. Do you work for a company that will match your gifts?Do you want to support a widow? 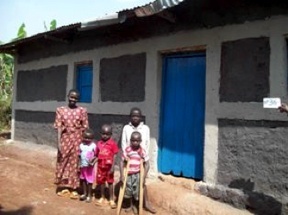 Do you want to build a house for a widow? One more thing -- the Spring 2012 Sister Connection Newsletter just came out, telling how you can help send a widow or a child to camp. Today would be a wonderful day to make an investment in the life of a sister in Burundi. Jumping monkeys. I've known about them all my life but never had a name for them. I remember the Family Circus cartoon from many years ago that had Billy taking the absolute most zigzaggy trip to the grocery store to get something for his mom that she needed "right away" so she could finish making dinner. Oh, that's me. I've been bugged by my propensity to distraction for years. Drives me nuts! Is it the curse of the creative mind? Maybe it's just me. They are so cute I couldn't take my eyes off them. Having a good time too, they are! 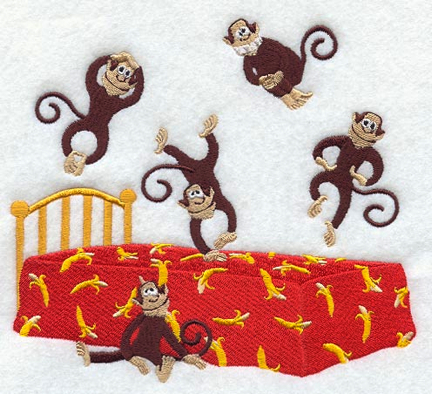 Jumping monkeys giggle and squeal, make faces, and perform silly antics to get your attention. At last I knew what to call those pesky distractions that keep knocking me off course. So what did he say to do about them? Wave to them (acknowledge their presence) then turn your back and ignore them! Simple to say; hard to do. But now that I know that the distractions are silly little monkeys putting on a show for me, the wisdom of Pat's advice is plain. So if you or one of your children or someone else you care about struggles to stay on task, dub those distractions as jumping monkeys and see if that doesn't help! For many of our growing up years we were without television. So the Sunday afternoons that we spent with our grandparents meant not only a chance to see Grandma and Grandad, eat Grandma's date pinwheel cookies and choose a game to play from their special game drawer, it also meant we could watch Bonanza! At 5:30 we kids would be gathered around the tv, in the middle of an adventure-filled episode, when Grandma would come into the room and switch to the Canadian station for their regular Sunday afternoon program, Hymnsing. For the next 30 minutes a group of young adults, dressed in coordinating outfits, would wander through gardens, stand by the shore, or find their places on a sound stage, singing hymns as choral arrangements or smaller groupings. The songs they sang were songs I loved -- except for that 30 minutes when I was wondering what was happening back on Bonanza! Have you ever been to a hymnsing? It's been a long time since I have, but at the last one they gave us a chance at the beginning to call out the numbers of the hymns we wanted to sing. Those few minutes created the agenda for the next hour. Then, one by one, the congregation would turn to the songs in our hymnals and would belt out some of the most powerful songs ever written. It wasn't necessarily the tunes that made the songs so powerful, nor the musicians at the instruments, and it certainly wasn't because of the singers. But the words of those hymns told the story of God and humanity, of our sin and His mercy, of our brokenness and His healing, of His greatness and our praise. I usually select one hymn at a time in my Hymn of the Month but I found this video that reminds us why we sing hymns. It features Bob Kauflin, whose videos I've shown here from time to time, explaining why they chose hymns for the style of music at the Together For the Gospel (T4G) conferencse, where thousands of pastors gather to affirm that, whether or not they agreed on every point of theology, they stand together on the main thing: the gospel. I hope the emphasis that I place each month on hymns strengthens you as you listen to the truth they present; I hope it challenges you to a deeper walk with Christ; I hope it makes you hungry for more of God. If you just see hymns as music for a different time (thus, irrelevant), I encourage you to give yourself permission to rock your world through hymns. CD available here or here. If you read my earlier post about Seattle Pacific University hosting Tent City 3 from January 23 to March 24 of this year, you know that I am impressed by how my alma mater demonstrated their motto, Engaging the Culture, Changing the World. After several years of dialog and preparation, SPU opened Wallace Field for a temporary home for residents of Tent City 3. I called Jeff Jordan, Vice President of Student Life, to ask him about the students' involvement and the impact this arrangement had on the students and the Tent City 3 community. Here's what he had to say. SPU hosted Tent City 3 to provide a space and services for its residents, but they wanted to do more than that. They also wanted the students and the community to learn about homelessness through forums. More on that later. 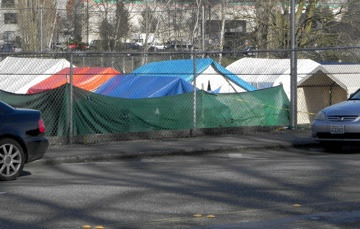 And they wanted to bring a part of SPU to Tent City 3. Before TC3 arrived, they explored ways that students could share friendship with their temporary guests. For the nine weeks Tent City 3 was housed on campus the students and cooperating churches sponsored chess tournaments, hosted a knitting club, held common reading sessions, visited, served a hot meal each night, provided some basic health care, and found other creative ways to say, "You are part of us." The athletic department held a sock drive, and passed out tickets to the basketball games. Some of the musicians from TC3 performed live on SPU's radio station, KSPU. (You can listen here.) Students and residents worked on a joint art project that will be displayed on campus. In their move from their previous encampment in Shoreline their library was ruined. SPU's Ivy Honorary Club donated 300 books to Tent City 3 and plastic bins in which to store and transport them. Several forums on homelessness were held on campus, bringing together students, staff, Tent City 3 residents and members of the community. Topics included The Gospel and Homelessness, Homelessness: a Crisis of Affordable Housing, and Growing Up Homeless. About 150 people attended a forum put on by Tent City 3 called The Homeless in Seattle: What Do We Want? with presenters who are either homeless or who work on their behalf. During their stay there were several university classes in which Tent City 3 residents were asked to participate. To all the requests that were made of them -- to share in a class, to allow a school class to come and visit, to have the Girl Scouts come and spend a couple of hours with them, groups who wanted to make donations of one kind or another to the TC3 community -- they gladly agreed. According to Jeff Jordan, they were incredibly appreciative of the support they received. And as their time neared an end, they didn't want to leave. One of the issues in serving the homeless community is the concern for safety. The Queen Anne community, parents and students were given opportunities to voice their questions early on and learn of the many steps the university had taken to ensure the safest possible experience during Tent City 3's stay on campus, things like speaking with police from the former TC3 locations and setting up communication between TC3 security and SPU security. Great care was taken to ensure the safety to students and visitors alike. "Tent City 3 is incredibly structured," Jeff Jordan told me. "They have a one-stike-and-you're-out policy. And they rely on the good graces of their host." So they too strive for a safe and peaceful environment. There were a handful of minor medical issues during TC3's stay and two times when an outsider came into the encampment to harass a former spouse, but those issues were quickly resolved. When moving day rolled around, says Jordan, it was hard to say good-bye to these friends. 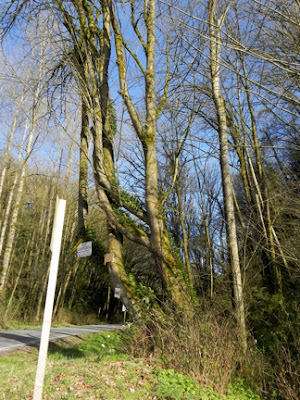 But on Saturday, March 24, at 8:00 in the morning, there was a huge community response. Hallows Church from the Fremont neighborhood arrived with a U-Haul to supplement the trucks that Tent City 3 rent for their moves, and many students and neighbors came as well. 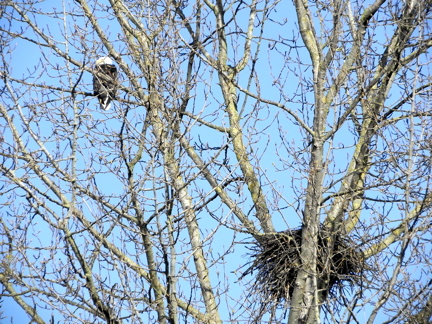 By 5:30 they were settling in well at their new home, St Mark's Episcopal on Capital Hill. Will Tent City 3 ever return to SPU? "We're open to the conversation for their return," says Jordan. I caught up with the Hat Sisters at their church's monthly senior adult luncheon. They didn't wear their hats to lunch, but they put them on afterwards and posed for me. My sister Peach and her family attend the same church as the Hat Sisters. 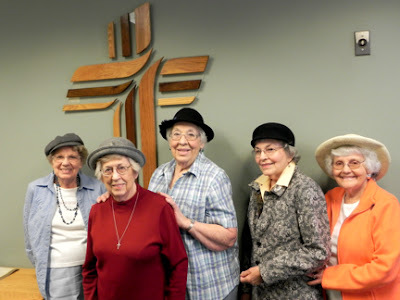 Over Sunday dinner a while back my niece Melissa said, "There were several women wearing hats at church today." I was taken aback. We had attended the same church when we lived in Marysville, and it just didn't seem like a wear-a-hat-to-church group. A week later I ran into the Mary Ruth at a memorial service. She was wearing a hat. "I am letting the color grow out of my hair," she confided to me, "and my friends are all wearing hats to support me." I looked around and there they were, in their hats. Their solidarity impressed me. But then, they are pretty impressive women. All born in the 1920s, they share the dubious distinction of being widows. It's what brought them together. It's their love for one another and the fun they have that keeps them together. When Mary Ruth, Barbara and Hildred all lost their husbands in 1999 they found support in one another. 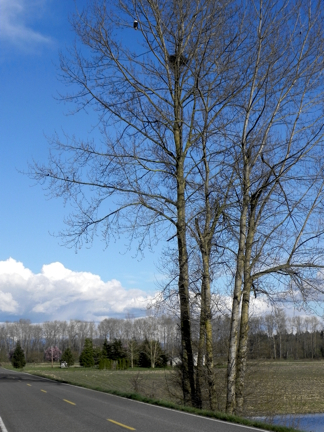 By 2003 they had each sold their homes and bought condos in a lovely complex in Everett. The "widow's row," where they sit at church each week, now includes Sylvia and Dottie. After church they usually go out to breakfast. Whoever drives gets to choose the restaurant, they told me. "But we're running out of places to go!" laughed Barbara. When they are not at church or church events together they just might be at the symphony or attending a Village Theater production or enjoying a game of Dominoes. Mary Ruth, the eldest, will be 92 in June. She is the only one left of the nine children in her family. She taught music and was a choral director at Spring Arbor College in her younger days. Two years ago the school hosted a reunion for people who had attended SAC in the 50s and 60s and invited her to come and conduct the reunion choir. When Barbara's kids were growing up she was a stay-at-home mom. She went to work in her 60s -- as a traffic flagger, bright orange jacket and all. She and her husband loved to camp and she was quite a fisherman. She's a writer and a poet. Hildred (she and Dottie are the youngsters at 88) worked at Boeing as a secretary, an estimator, and later in the Space Division. She painted her name on the door of Boeing's 5000th B17, and left her finger print on the Moon Buggy. She'd love to have some of her family members go to the Moon and see the Moon Buggy. Who knows? Maybe space travel will be available for a future generation! Sylvia said she, too, was at Boeing when the 5000th B17 was rolled out. She had a Japanese-American friend who had been interned during World War II. After the war ended the friend was wishing for a job so that she could have a paycheck. Sylvia told her about openings at the Fredrick and Nelson department store, and that she'd go with her to apply. Both of the women got jobs there, and Sylvia ended up staying 18 years. Dottie had worked as a long distance telephone operator during World War II. Her husband's job with Boeing brought them to the Northwest and provided training for her at Edmonds Community College to be an illustrator for the company. I haven't seen her work, but I understand from her friends that she is a fine artist. Each one of these women had a positive attitude and a spirit of adventure. They are a total delight and I am privileged to know them. If you're ever at a restaurant late on a Sunday morning and you see five 90ish women hanging out, enjoying themselves, and wearing hats, you just might be watching the Hat Sisters in action! I have a story which has been in my mind quite a bit lately. While I was in college I was asked if I'd be willing to do some dog sitting for an evening. I'm not overly fond of dogs, but I said I'd go. I went to the home of Rudy Pick and his wife (her name escapes me now) to meet them and their black lab, Linda. The Picks were Jews from Europe, survivors of a concentration camp. Their accents were still very strong, although they'd been in the United States since the late 40s. Their home was filled with fascinating books and things like autographed photos of Albert Schweitzer. Mrs Pick was a master at caring for violets. We had tea and talked about Linda. They told me that they needed someone to stay with their dog when they went out because once when they were away their former dog had been poisoned. Our conversation eventually came around to their experience during World War II. I don't know the details about their being arrested and sent to camp, nor do I know which camp it was. I wish I'd written it all down. But this part I do remember. 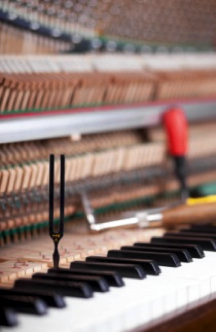 Rudy was a piano tuner, and he was occasionally called up to tune the piano in the officers' quarters. A good piano tuner wants to know if he has done a proper job, so he will play a piece and listen carefully to the sound. The day came that all the men in the camp were rounded up. They were put on a train, to face their death. But Rudy was allowed to stay behind. Later he asked why he was spared. "One day you tuned our piano," he was told by the commanding officer, "and when you finished you played my favorite song." The image in my mind, as we consider the day of Christ's crucifixion, the long dark waiting, and the day of triumph, is of a lamb. Isaiah talks about the suffering servant as a lamb, led to the slaughter, silent before his accusers. And he talks about us, sheep who have gone astray. The death of the Lamb give us life, and the brokenness of the Lamb provides our healing. John the Baptiser saw Jesus approach and said, "Behold, the Lamb of God who takes away the sin of the world." Please take a few moments to watch this moving recitation of Isaiah 53. 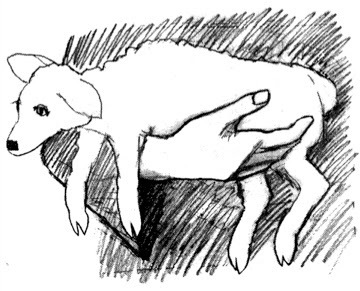 And then I invite you to listen to two songs that celebrate the Lamb. (You can choose between the two if you like, but I simply couldn't make a choice myself!) The first is of Dottie Rambo singing a song which she wrote called Behold the Lamb. The other song is by Andrew Peterson and is called Behold the Lamb of God. and they will reign on the earth." and ten thousand times ten thousand. and the living creatures and the elders. and strength and honor and glory and praise!" The four living creatures said, "Amen,"
and the elder fell down and worshipped. 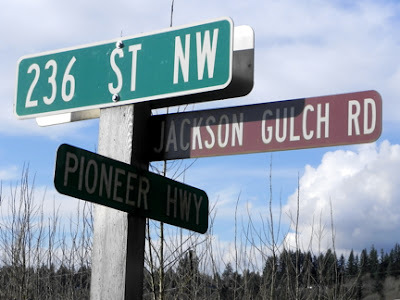 If you find yourself anywhere near the intersection of Jackson Gulch Road and Pioneer Highway, just north of Silvana, check out this surprise. 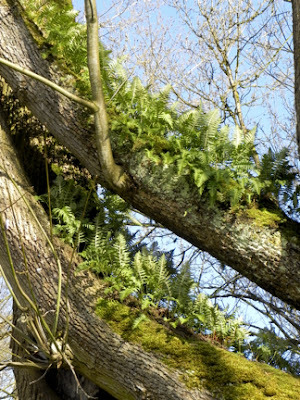 There are ferns growing on the branches of this crazy tree that, long ago, must have been the perfect climbing tree in Snohomish County! I have never seen anything like it. Have a look. We decided to go home through the flats, so we turned west on Norman Road. We came upon this eagle, a sentinel keeping guard over his nest. 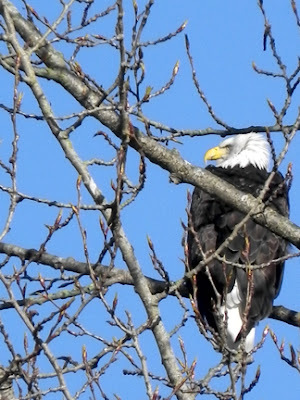 Undeterred by the many smaller birds that rested temporarily in his tree or the flock of geese that flew past, he stayed affixed to his branch. 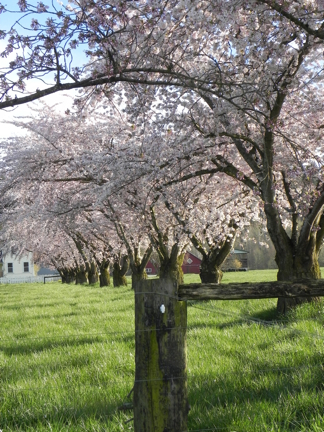 Further down the road was this row of cherry trees in full blossom. I urge you to take the tree tour for yourself, if you get a chance. 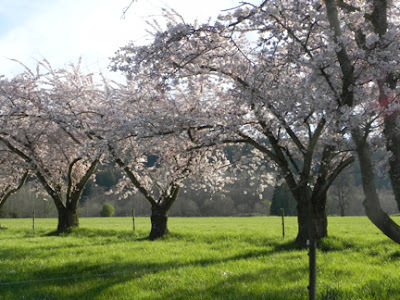 And even if it's raining, the eagle is gone, he ferns and cherry blossoms no longer spectacular, a country drive will do your heart good. In chapter 18 of the book of John, we read about three people who had to answer the question, "What will you do with Jesus?" We see Peter in the courtyard of the high priest while Jesus is being questioned, and later at the fire, warming himself. He has pledged his undying loyalty to Jesus, but Jesus has predicted Peter's betrayal. And Peter has stood the test. Having come to Jesus' defense in the garden (he had struck one of the men who had come to arrest Jesus, cutting off his ear) now he is standing by in the wings. But when identified as a follower of Christ, he denies knowing Jesus -- three times! Then the rooster crows, just as Jesus had said, and Peter is undone. Rather than running, Peter realizes the truth of his own failure to live up to his promise to Jesus. He breaks down, weeping. He recognizes his own need for Jesus, and this moment becomes a turning point for him. Seeing ourselves for who we are in the presence of God always leads to a crisis. So how did Caiaphas, the high priest, and Pilate, the Roman governor, respond when they, too, were confronted by Jesus? Matthew records that the chief priest and the whole Sanhedrin were looking for false evidence against Jesus (26:59), so we know that the high priest was not too open to truth. In the midst of the questioning of Jesus, one of the officials struck Jesus in the face. "If I said something wrong," Jesus replied, "testify as to what is wrong. But if I spoke the truth, why did you strike me?" (John 18:23). In the presence of Jesus, the high priest rejected the truth and sent Jesus on to Pilate. Unlike Caiaphas, Pilate had no vested interest in this case. He tried to pass Jesus back to the Jews but when he was told that it was illegal for them to perform executions he questioned Jesus himself. 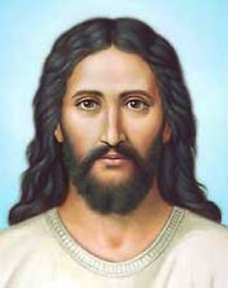 In their dialog, Jesus said that He came "to testify to the truth. Everyone on the side of truth listens to me" (John 18:37). Three people, Peter, Caiaphas, Pilate -- all in the presence of Jesus. And three very different responses. Peter cried out with a heart broken by his own failure when faced with the truth. Caiaphas didn't want to know the truth. He refused it. Pilate didn't know the truth and rejected it when it was presented to him. And he justified himself for his complicity in Jesus' death. Don't all responses to Jesus fall into one of these three categories? I think so. Accept. Refuse. Reject and make excuses. These are the responses people had to God's truth all through the Scripture and they are still the responses people have today. How about you? What will you do with Jesus? I know you can't get on the plane with me and go to the Sister Connection Retreat in Burundi (in central Africa) that I'll be attending in July, but I want you to be a part of this trip just the same. For starters, I've got a video I'd like you to see which was presented in yesterday's church services. Here's what else you can do: you can pray for us. Pray for the details to fall together for each one of our team. Pray for our safety as we travel and as we all gather together. Pray for the Lord to bring joy and healing and blessing to the women at the retreat and to their children, who will also be attending camp at the same time. In the video I said there would be 300 widows at the retreat, but I have since heard that there will be 500! These are women who lost their husbands through ethnic conflict in the late 1990s/early 2000s. I'm grateful for the ministry of Sister Connection, which is restoring the dignity of these women who are outcasts in their society and helping them transition to self-sufficiency. If you'd like to be a part of the trip by contributing toward the cost you can do so through the Warm Beach Free Methodist Church at 20815 Marine Drive, Stanwood, Washington 98292. Of course you can also sponsor a widow through Sister Connection! I'll post occasional updates as we prepare for the trip and I'll post stories and pictures of the trip as well. As I go I will know that I represent others who care about Burundi's widows and their children, and are praying for them.